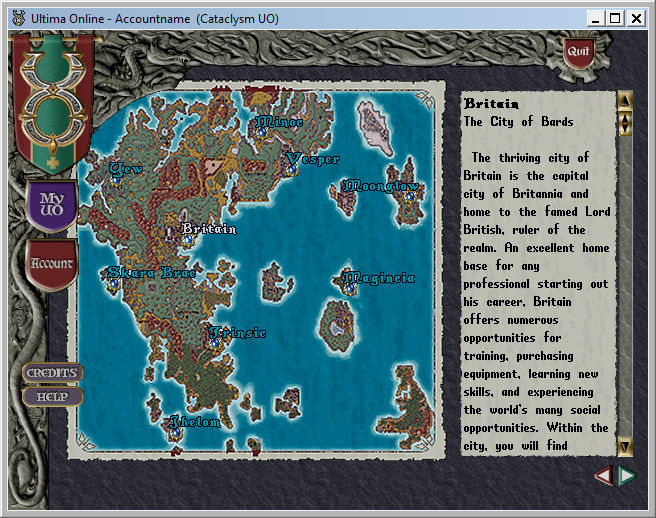 This is a brief guide for new players going over the basics of Ultima Online gameplay. 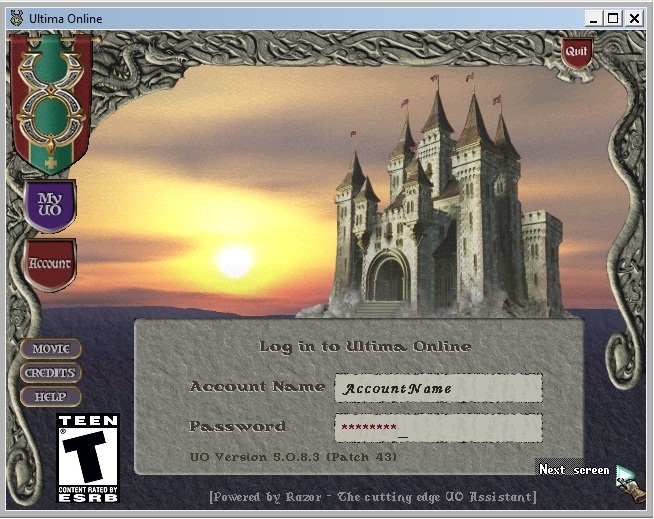 You will learn about the interface window, how to create your character, how to controll your character, basic world commands, and other important information on how to play UO. You can move the interface items around on the screen by dragging them with the mouse. 1) This is your character, in gameplay. Your character is always in the center of the screen. 2) This is the Overview Map. This map can be opened by pressing Alt+R. Pressing Alt+R two times will open a larger view. 3) This is your Character Paperdoll. This can be opened by pressing Alt+P. You can single click and drag items onto your paperdoll, off your paperdoll, or from you paperdoll to your backpack. The paperdoll is used to equip clothing, items, weapon, and armor. There are buttons on the side of the gump, you can also access your skills menu, help menu, and change your character from Peace mode to War (combat) mode. 4) This is your Backpack. You may drag items into or out of the backpack. You access your backpack by pressing Alt+I, or by double clicking the backpack icon on your Paperdoll. 5) This is your status bar. The status bar can be accessed via your Paperdoll. Double clicking the status bar will give you the Detailed status that is shown. You can also single click on your character icon and drag the status bar out. 6) This is your skills menu. This can be accessed by pressing Alt+K, or via your Paperdoll. Skills are organised in drop-menus. The blue button next to a skill name allows you to use that skill. Launch client through Razor or UOSteam. Choose an account name and password. Accounts are created on initial log in. You may press enter, or the small arrow in the bottom right corner to proceed. You will now see the Shard Select screen. Click where it says Cataclysm UO to proceed. 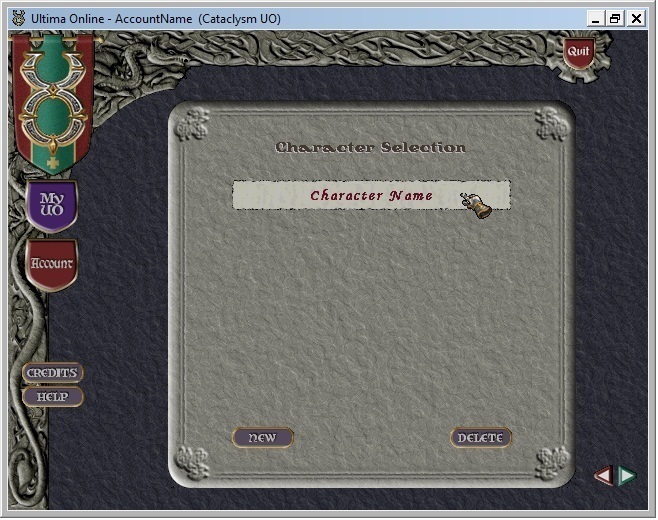 Click New to begin creating your character, or double click a character name to log in. You may create or delete characters from this menu. Characters can only be deleted if they are at least seven real-life days old. You will now be able to choose skills for your character. If you don't know what to pick, try choosing a pre-set class such as Mage, Warrior, or Blacksmith. You may also pick your own three starting skills in the Advanced tab as displayed. Please note that we do not support the Necromancer, Paladin, Ninja, or Samurai classes. You will now be at the Character Creation screen. 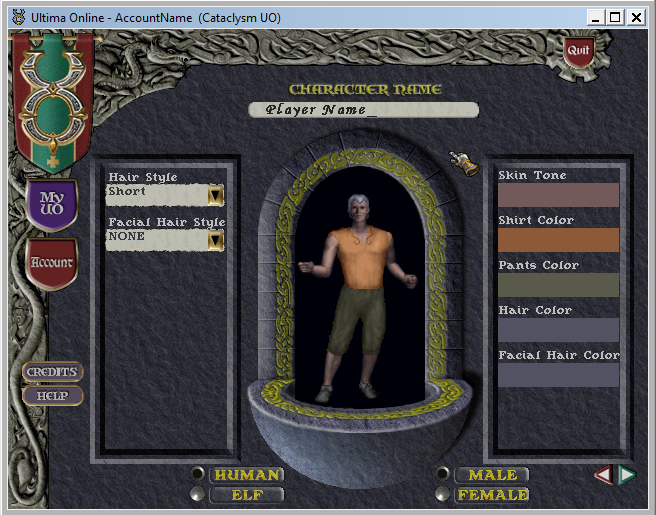 You may edit the hue of your character's clothing, change your character's hair and facial hair, skin tone, and gender. Please note we do not support the elf race. You will not be able to continue until you name your character. Continue by pressing the small green arrow in the bottom right corner. The default start location is the town Britain. 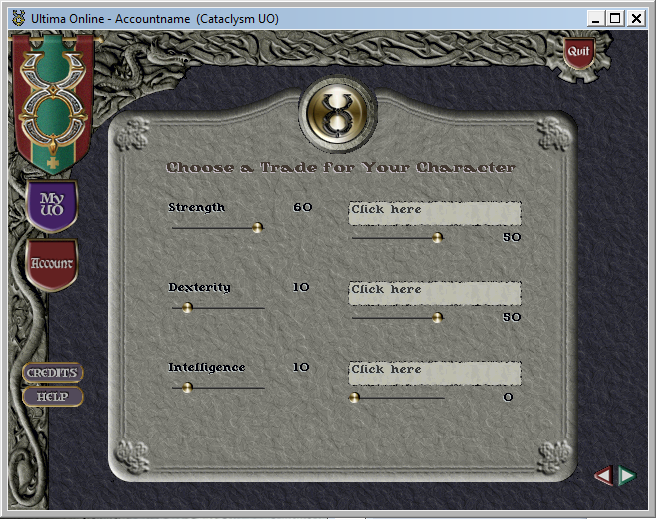 Proceeding from this screen will launch the game client. Your character can move in eight directions. To move your character, simply move the mouse in the direction you want the character to run, and right click. Your character will follow your cursor. If you keep the cursor close to your character, your character will walk. To talk to other players, or imput game commands, simply type what you want to say, and press enter. Your speach will be displayed above your characters head. Most players will notice your talking to them if your character is physically facing them. Double click to open door, open chest, equip item, or use potion, or view a players paperdoll. Single click to read a sign, see the name of an item or sign. Your character is by default in peace mode. By pressing the "Peace" button in your paperdoll, you will toggle "War" mode. Your character takes a combat stance when in War mode. Double clicking a player, beast, or animal while in War mode will cause your charater to Melee Attack. Interacting with Vendors, using the Bank Most towns have a Town Bank, where a player can access their Bank Box to store or withdraw items or gold. To open the bank box, simply stand in front of or inside the bank and type the word "bank." A container will open and you can store your items or gold in here. In the town Britain, the main bank is located on the west side of town, just south of Lord British Castle. Single click hanging signs on front of buildings to see the name of the business or location. You may buy and sell items from vendors. To buy from, or sell to a vendor, simply say "vendor buy" standing near the vendor you are attempting to buy from. You may also say "vendor-name buy" or "vendor-name sell" to address a particular vendor. You may see the vendors name by single clicking them, or double clicking them to view your paperdoll. A menu will show with the items and price of the items available for purchase. Clicking an item on the menu will add it to the list of purchase. Clicking the arrow on the gump will complete the transaction. 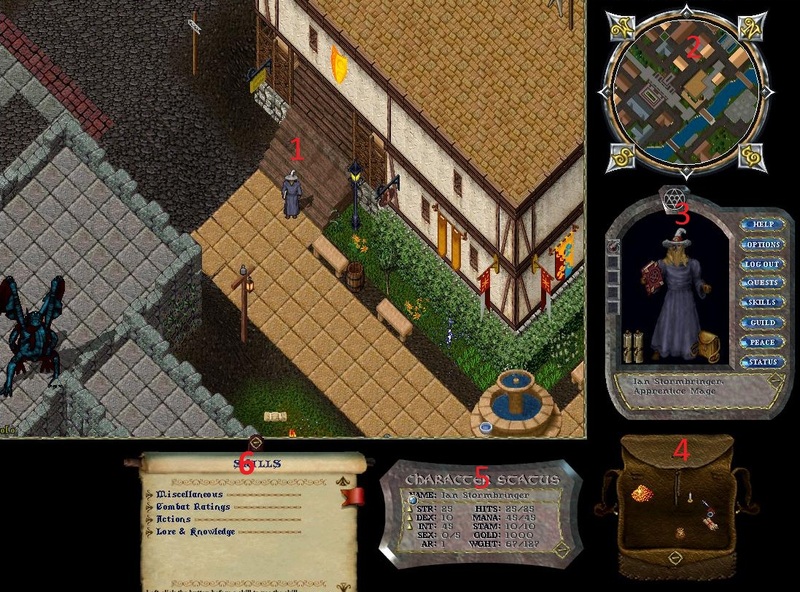 In Ultima Online, all players, monsters, animals, and vendors (which we call 'mobiles') have notoriety based on their Fame, Karma, and Murder Counts, or status between other players. Notoriety is separated into colors. You may see what notoriety a mobile is by single clicking them and noticing what collor their name or status bar is. Notoriety dictates weather a mobile is good, criminal, neutral, at war, murderer, or staff. Blue – This is the 'Good' notoriety. Players all start out as Blue. Townsfolk are typically Blue. Blue notoriety mobiles that are not player controlled will not go out of the way to harm your character. You may not attack a blue mobile without becoming a Criminal. Staff of the 'Counselor' rank may have a Blue name color. Gray – This is 'Neutral' notoriety if the mobile is an animal, or 'Criminal' if the mobile is a player. If your Karma falls low enough (by doing misdeeds) you may become Gray. Anyone may attack a Gray mobile without any negative consequences. Animals are typically Gray, and will normally not go out of their way to harm your character. You may become temporarily Gray for five minutes if you attack a Blue mobile or use negative skills such as Stealing. You may be attacked during this time, and guards may be called upon you in some situations. Red – This is the 'Murderer' notoriety. All monsters are Red. Creatures under this notoriety will nearly always attack players when players come within their line-of-sight. Players will become murderers if their Short or Long term murders is greater or equal to 5. Players will remain red until their Murder Counts decay over time below the allowed level. You will receive no negative consequence from attacking a Red mobile, in fact, you may gain in Fame and Karma from defeating these mobiles. Guards may be called to kill Red mobiles if they step within a guarded region. Staff of the 'Game Master' rank may have a Red name color. Orange – This is the 'At War' notoriety. This notoriety is only relevant to player vs player combat. You will notice an enemy player as orange if they are part of a guild, or faction, that is at war with you. Orange players are always orange to each other, but you will not see yourself as orange if you single click your character. Orange players may attack each other without any negative consequences, and other players may not interfere with this combat freely. Green – This is the 'Friendly' notoriety. Guildmates will be Green to each other. Guildmates may spar, steal from, and fight each other without any negative consequences. Staff of the 'Seer' rank may also have Green name color. Purple – This is the 'Administrator' notoriety. Only staff of the 'Admin' rank will show up as Purple. You can only perform melee combat by being in " war " mode. As explained above, war mode can be toggled by pushing the Tab key, or by pushing the " peace " button on your paperdoll. You can perform magery combat without being in war mode. When in war mode, you will atack any mobile thatyou double click. You must be standing directly next to the combatant you are attacking. You will automatically attack with whatever weapon you are holding. Your character will swing the equiped weapon when in range, and will not stop attacking the current target unless the target is defeated, you toggle out of war mode, or press Tab twice to clear your current target. When a combatant is destroyed, you may double click their body to open the "corpse container." You will see the items and gold that the combatant had dropped, in this container. Simply drag the desired items or gold out of the container, and place them in your packpack to loot the corpse. You can eather place them directly in your packpack, or drop them on your character icon to place the items in your pack. Just like mobiles, corpses also have notoriety, and looting a Blue corpse may result in you becoming temporarily Criminal. We recommend using Razor for your hot keys instead of using the in game options menu to set key bindings. On Razor, the 'hotkeys' tab contains every action and spell in the game. We recommend hotkeying all actions you will need to use in game. You may lay out your hotkeys as you like, and tweak these settings for optimal ease of use. Idealy, you want to hot-key any spells, skills, or actions you will frequently will use. For additional help with Razor, please see the runuo website at www.runuo.com. "i ban thee" to remove a player or creature from your house and place them on a ban list. They will no longer be able to enter your property. "remove thyself" to kick a player or creature out of your house. "i wish to lock this down" to lock items to your house. They will not be movable unless unlocked via owner command. You may also do this by double clicking your key, and clicking the object. "i wish to release this" to unlock objects in your house. You may also do this by double clicking your key, and clicking the object. "i wish to secure this" to create a secure container in your house. It functions like a stationary bank box and will be freely able to be opened and used based on the access level granted. 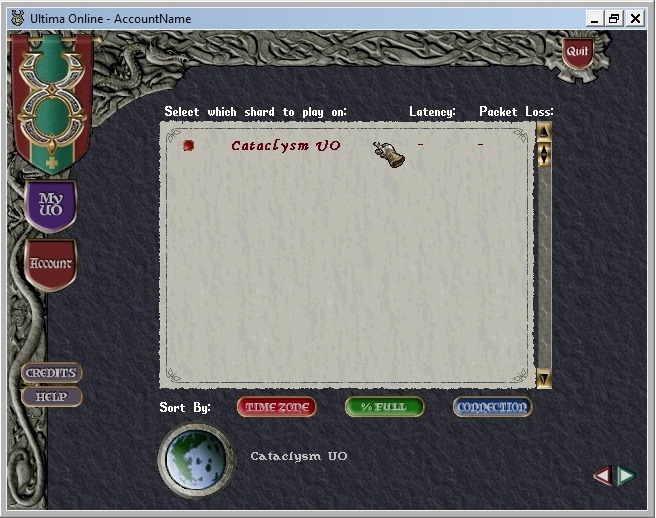 "[web" shows Cataclysm related links on an in game menu. 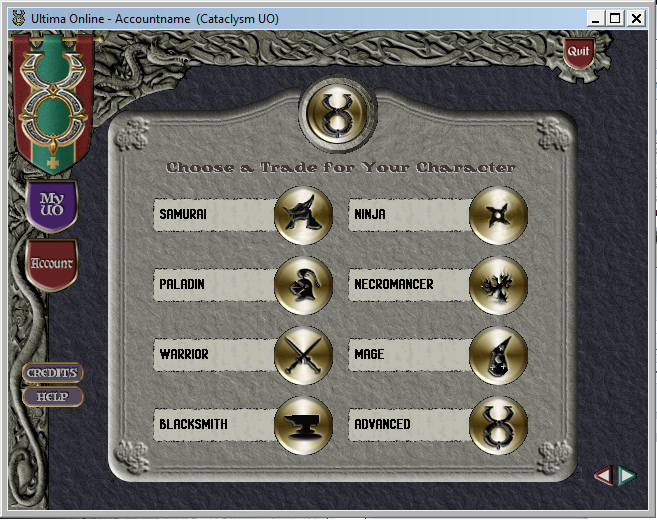 "[website" opens the Cataclysm website in your browser. "[forum" opens the Cataclysm forums in your browser. "[bugs" opens the Cataclysm Bug Report forum. "[on" shows the current online players. "[e " opens the menu of available emotes. "[where" shows your general location. "[g list" shows your fellow guild members that are online. "[g" + message to communicate with online guild members. "[publicchar" to make your player skills and stats public on MyCUO. "[privatechar" to remove public character status on MyCUO. If you need any additional help, you may contact a staff member or ask a question on the forums.